A file with the FB2 file extension is a FictionBook eBook file. The format was built to cater to fictional writings, but can of course be used to hold any type of eBook. FB2 files are DRM-free and can contain footnotes, images, text formatting, Unicode, and tables, all of which may or may not be supported in some FB2 readers. Any images used in the eBook, like PNGs or JPGs, are converted to Base64 (binary) and stored within the file itself. Unlike other eBook files like EPUB, the FB2 format is just a single XML file. Some FB2 files are held in a ZIP file and are therefore called *.FB2.ZIP. If you can't open your file in the programs mentioned below, double-check that you're reading the file extension correctly. You might actually be dealing with an entirely different file format that has nothing to do with the eBook format, like FBC, FBX (Autodesk FBX Interchange), FBR, FB! (FlashGet Incomplete Download), or FBW (HP Recovery Manager Backup). You can read FB2 files on a computer with many different programs, including Calibre, Cool Reader, FBReader, STDU Viewer, Athenaeium, Haali Reader, Icecream Ebook Reader, OpenOffice Writer (with the Ooo FBTools plug-in), and probably some other document and eBook readers. Some web browsers support add-ons that enable the viewing of FB2 files too, like FB2 Reader for Firefox. Since many FB2 files are contained within a ZIP archive, most FB2 file readers accommodate this by reading the *.FB2.ZIP file directly without having to extract the .FB2 file first. If not, you may need to use a free file extractor like 7-Zip to get the FB2 file out of the ZIP archive. If you read a lot of e-books on your computer, you probably have at least one of these programs already installed. If that's the case, and you double-click on an FB2 file but it opens in a program that you'd rather not it open in by default, please know that you can change this. 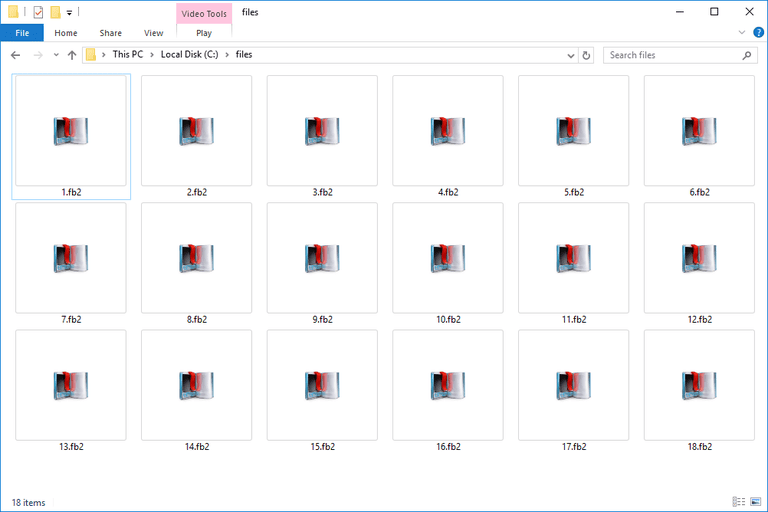 See our How to Change File Associations in Windows for a complete tutorial. It's very easy to do. On iOS, you can install FB2Reader or KyBook to load FB2 files directly to your iPhone or iPad. For example, FB2Reader lets you send books to the app from your computer browser or import them from places like Google Drive and Dropbox. FBReader and Cool Reader (both of which are Windows apps too, like mentioned above) are examples of free mobile apps that can read FB2 files on Android devices. Most popular e-readers, like Amazon's Kindle and B&N's Nook, don't currently support FB2 files natively, but you can always convert your FB2 eBook into one of the many formats supported by your eBook device. See How to Convert an FB2 File below for more on that. The PocketBook is an example of an eBook device that does support the FB2 eBook format. Converting an FB2 file can be accomplished with a free file converter like the online converter Zamzar. This website can convert FB2 to PDF, EPUB, MOBI, LRF, AZW3, PDB, PML, PRC, and other similar eBook and document formats. Another option for converting your FB2 file is to use one of the FB2 viewers mentioned above, like Calibre. In Calibre, you can use the Convert books button to choose between many different eBook formats to save the FB2 file to. In other programs, check for an option like Convert, Save As or Export, and then choose from the list of formats you're given. Every program does this a little differently but it's not hard to find if you dig around a bit.